A 5’7 quarterback leads a first-year varsity program to a 15-0 record on their way to the state championship game. As far as Texas high school football history dates back, only two teams have made a state championship in their inaugural season, Beaumont West Brook in 1982 and Shadow Creek in 2018. West Brook won the state championship in an 11-5 season. The Sharks fell just short of a championship, but what they did along the way, reeling off 15 straight wins, was unprecedented. The story of how Shadow Creek made history starts at the very beginning, from the hiring of Head Coach Brad Butler. In 2014, Alvin ISD broke ground on High School #3, as it was known at the time, needing the extra high school to compensate for the growing Pearland area. The school would take in students from nearby Manvel and was considered a 5A school, the second largest classification in Texas. On January 16, 2016, the Alvin ISD school board announced that Brad Butler would the the Sharks’ first head coach, as his hiring was approved in an unanimous 7-0 vote. Butler was somewhat of an in-house hire. He held a multitude of positions at Manvel, a state powerhouse in the district. Butler was offensive coordinator, quarterbacks coach and assistant head coach in his time with the Mavericks. 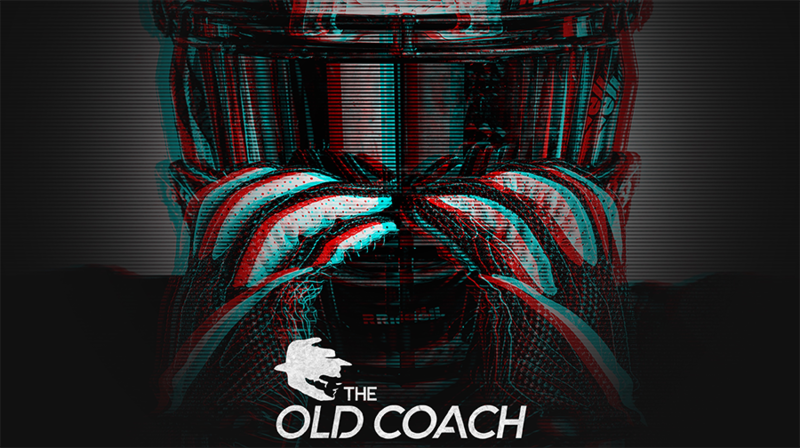 Now, for the first time in his 20-year career, he was a head coach. When Butler took the job, he brought along young prospects from Manvel, including then sophomore Jamarian George. George was only 5’4 at the time but his arm strength and his otherworldly speed couldn’t be denied. Entering the first season as a team, Butler had his quarterback. George left Manvel and never looked back. Even though he knew, as a freshman, that he’d only get one shot at a varsity campaign, he had faith in his new coach. Butler and the coaching staff quickly laid the foundation for a successful program. Rather than wallow in the junior varsity ranks for two years or throwing his young team into a varsity schedule immediately, the Sharks went a different route, electing to play an independent schedule that would test the young team. Year one was about getting accustomed, the Sharks finished 7-2 with impressive wins against KIPP Sunnyside, Hightower and Glenn. Their two losses came against a tough Silsbee team and Midland Christian. Year two was about preparation. Still one year away from being eligible for playoffs, Butler structured a schedule meant to push the team and prepare them for the grueling travel that comes with postseason play. The Sharks traveled far, with games in Midland, Brownwood, Leander and Marshall. After two years of the independent schedule, the Sharks made their varsity debut in 2018. Rarely does a first-year varsity program have multiple DI talents on both sides of the ball, but Shadow Creek was no ordinary first-year program. In fact, the expectations this team had was extraordinary opening the season. Led by, the now 5’7, George, the Sharks offense was electric. In the backfield, George and running back Marquez Huland were a lightning and thunder combo. Through the air, George had plenty of weapons to work with in Kealon and Jared Jackson. Yet, as good as the offense was, Shadow Creek was defined by their feisty defense. Four-star 2020 DE Alec Bryant led the way up front, coming up with 49 tackles, 18 TFL and eight sacks. In the backfield, the aforementioned Alford and 2019 Houston safety commit Ronald Nunnery led a secondary that took pride in their ability to force turnovers and their bone-crushing hits. Still, even with all the talent on both sides of the ball, not many people outside of the locker room expected the Sharks to make much noise in their first season, they weren’t supposed to escape their district, much less their region or area. But Shadow Creek silenced the doubters. How? The relationship between the players and coaching staff. In their first game, the Sharks made a statement, pulverizing Summer Creek 43-7. It became apparent that this team wasn’t ordinary. The Sharks finished off their first month of varsity football with an even more impressive 35-14 win over district rival Angleton. Entering October, Shadow Creek was undefeated and catching the attention of the Houston area. October proved to be a tougher test. After two blowout victories against Texas City and Ball to open the month, the Sharks ran into Friendswood, where they pulled out an eight point victory in their first close game of the season. Looking to bounce back from their loss to Angleton a week earlier, Foster gave Shadow Creek everything they could handle, jumping out to an early 21-7 lead at halftime. After the half, Foster scored two more touchdowns and for the first time all season, Shadow Creek faced what should have been an insurmountable deficit. Then, with under a minute left George ran in a touchdown to begin the comeback. After two touchdowns in the fourth quarter and an impressive showing by the defense, the Sharks faced a six-point game with under two minutes remaining. Shadow Creek immediately got the ball back, and with less than a minute left, George found Jared Jackson for a 32-yard touchdown and the ensuing extra point sealed the 27 point comeback. It wasn’t the last time the two teams would meet however, but Shadow Creek’s undefeated streak was still intact. The Sharks had survived their toughest test of the season and weren’t looking back. By mid-November, Butler had secured an undefeated regular season but the fairy tale wasn’t over just yet. Placed in the 5A-DI playoffs, the road to the state championship was not easy. After back-to-back games in Bryan, the Sharks headed into a rematch with Foster. Once again, the Falcons jumped out to a halftime lead, this time more manageable at 13-7. After an exchange of scores in the third quarter, Shadow Creek still trailed, 21-13. This time, the Sharks weren’t leaving anything up to a last second comeback. Within the first two minutes of the final quarter, George ran in a touchdown, but failed to convert the 2-point conversion, bringing Shadow Creek within two. The defense did their job, allowing George to punch in another touchdown to secure a 25-21 win. 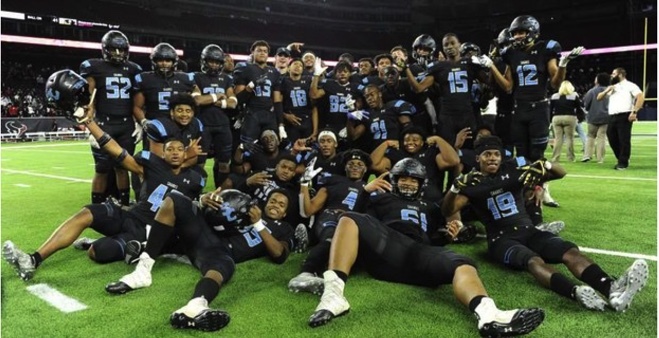 Now just one round away from the state championship, Shadow Creek traveled to NRG Stadium where the only thing that stood between them and history was 13-1 Wagner. Once again, the Sharks found themselves down at the half, 10-7. Opening the third quarter, Wagner increased their lead 17-7 putting the Sharks’ chance at history in peril. George quickly brought his team back into the game, with a 60-yard touchdown for a 17-14 score. Then, the the fourth quarter, Shadow Creek took off. After another exchange of touchdowns to open the final quarter, the Sharks ran away, scoring 20 unanswered points behind the legs and arm of George, who finished with 109 passing yards, 92 rushing yards and four touchdowns overall. Then came the biggest challenge of the year, the state championship. For Butler, this game meant a little more, the Scots’ legendary head coach, Randy Allen, was Butler’s coach when he was in high school at Brownswood high school. Butler tried to shut out the noise and he did a good job of it. Entering as a heavy underdog, Shadow Creek was rattled early. Highland Park drove down the field quickly, jumping out to a 7-0 lead within the first two minutes of the game. After punting on their first offensive drive, the Sharks needed a spark and fast. In their time of need, Alford stepped up, coming up with an interception in Highland Park territory to give George and the offense a short field. George made quick work finding Jared Jackson for a 28-yard touchdown to bring Shadow Creek within one, 7-6. After back and forth punts, and an interception by the Scots defense, Highland Park retook the lead late in the first quarter with another touchdown for a 14-6 lead. In the second quarter, the Scots took control, outscoring the Sharks 10-3 for a 24-9 lead at halftime. Facing another hole entering the final 24 minutes, Shadow Creek’s second half magic had run out. The defense held their own in the third quarter, but the offense had no answers for the stout, disciplined Scots defense. Ultimately, the deficit would be too much for Shadow Creek to overcome, but that didn’t stop George from leaving his mark, setting a record that can never be broken. Facing 3rd and 26 from their own one-yard line in the final quarter, George took off, racing past Scots defenders for a 99-yard touchdown. The run marked the longest play from scrimmage in state championship history and brought the Sharks within striking distance. George’s name is forever etched in history, and no one will ever overtake him. Down ten points, the Sharks were in a race against time and they couldn’t beat it. The Sharks couldn’t pull off the upset, and their rookie season ended at 15-1, but the program’s future is bright. In fact, Alford expects the team to run it all the way back and in 2019, they hope to finish the job. With Alford, Bryant and Harris returning on the defensive side, the expectations have been set, now it’s time to execute. Offensively, there’s a lot of talent that needs to be replaced, but that shouldn’t be too tall a task. Replacing George is sophomore Kyron Drones who’s more than fit to do the job having sat behind a great mentor for two years and has all the tools to succeed. For George, the crushing loss was tough to get over, but as he looks towards the future, he can’t help but reflect on the history made.